The St Marys Cement plant — located along the Rogue River in Detroit — produces 200 to 250 tons per hour (181 to 226 mtph) of Portland cement. Front loaders transfer dusty 1.5 to 2 inch (38 to 50 mm) minus limestone and gypsum aggregate onto the 30-inch-wide #14 belt. Inclined approximately 20 degrees at the point of loading, the belt conveys cargo for 20 feet up to ground level, moves horizontally for 200 feet (61 m), then begins another long 30-degree incline into the top of a 50-foot-tall tower. 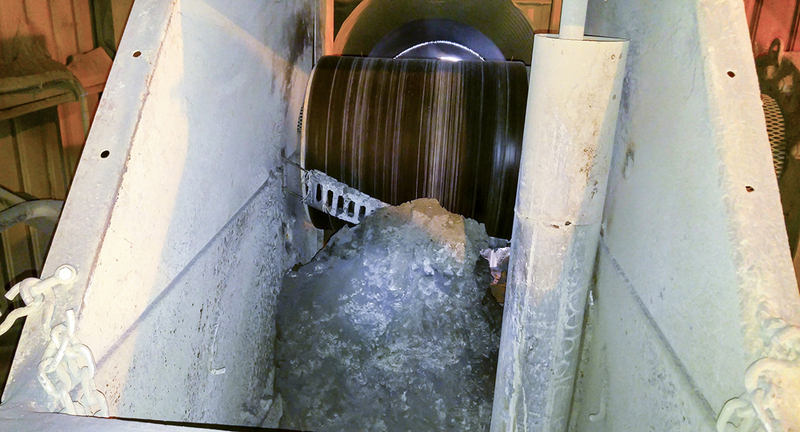 The conveyor discharge zone, with only enough room to fit one primary cleaning blade, offloads into a chute. Roughly 30,000 tons (27,215 metric tons) of raw material and clinker arrives weekly by truck and ship. The aggregate is offloaded to an outdoor storage area, where the material tends to get saturated when the Michigan weather turns wet and cold. This causes large amounts of mud and sludge. The St Marys Detroit plant is prominent on the skyline as commuters drive across the Rogue River. Maintenance technicians periodically had to stop other essential duties and shut down the system to replace frozen return idlers and prevent further damage. After digging out the tail pulley, workers needed to clean the face, which often had abrasive buildup that could reduce the belt life. The cleaner required regular tensioning and periodically needed to be removed, re-cut and shaped. In addition, 2 to 3 workers spent up to 8 hours twice per month to clean the loading zone and the belt path using shovels and a vacuum truck. 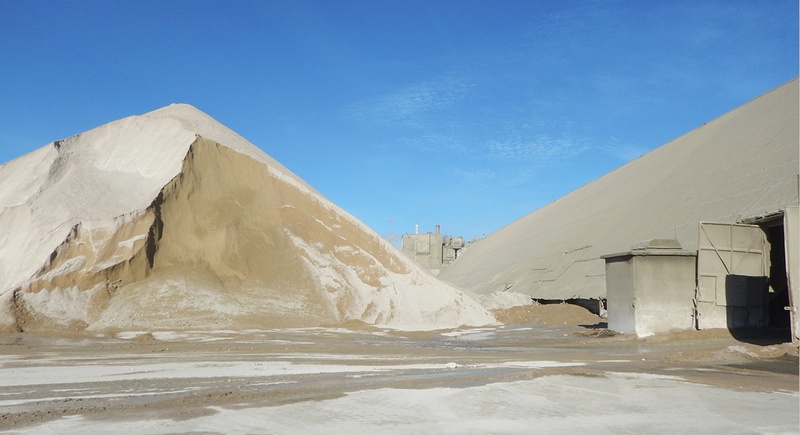 Limestone and other raw material taken from trucks and barges is stored in outdoor piles. Martin technicians concluded that the #14 conveyor was an excellent candidate for the Martin® CleanScrape® Primary Cleaner. It requires considerably less space than other primary cleaners, can be effective enough to eliminate the need for a secondary blade, and is proven to deliver as much as 4x the lifespan of competing urethane blades. The previous blade accumulated build-up and encrusted material, degrading cleaning performance. 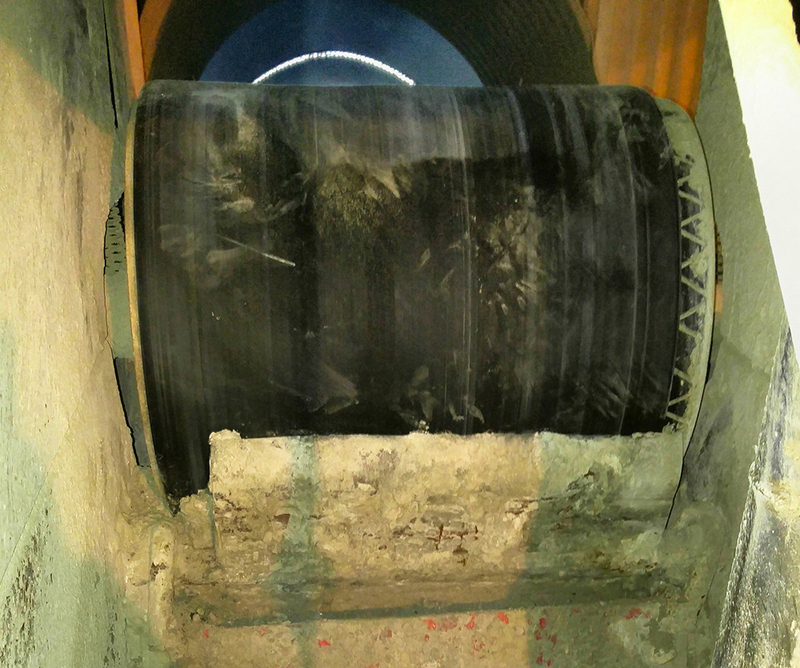 The flexible cleaner is installed diagonally across the discharge pulley, forming a three-dimensional curve beneath the discharge area that conforms to the pulley’s shape. The unique design incorporates a matrix of tungsten carbide teeth and is tensioned lightly against the belt to prevent damage to the belt or splices. Despite extremely low contact pressure, it has been shown to remove as much as 95% of potential carryback material. Designed for belt speeds up to 780 fpm (4 m/s) for mechanically spliced belts, pulley diameters up to 50 inches (1270 mm), and belt widths up to 96 inches (2438 mm), the CleanScrape is engineered to perform under the punishing conditions of cement applications and other bulk handling industries. The patented design requires very little maintenance. The tensioners are tightened during initial installation, and typically no further adjustment is required over the life of the blade. Mounted diagonally, commonly at a 17º angle, the CleanScrape spans the entire belt profile. After a full year of punishing 24/7 operation with little downtime through conditions that included cold slush and mud, as well as hot and dry dusty material, the original CleanScrape cleaner continues to perform consistently well, without a single adjustment. The cleaning schedule has been altered from a 2 to 3 person crew over a full shift twice per month, to just a single worker hosing down critical areas for an hour or so, once per month.